Patient may qualify under criteria I, II, or III. Has limited mobility AND any of the "sub-criteria" referenced below. The WAFFLE® Mattress Overlay is made to go right on top of your existing mattress. The air overlay cradles the body, providing protection and treatment for pressure ulcers. For more information, please click here to go to manufacturers' website. Click here for medicare qualifying criteria. Dual-layer, progressive resistance; provides maximum support and comfort for patients up to 400lbs. Heel slope feature reduces pressure in the feet. Pressure reducing, increases air circulation. Reduces risk of tissue breakdown. Contamination barrier. 3 layer system with 2 layer heel support. Available with or without side rail. Allows clinician to control air flow for patients weighing Between 65 and 265 lbs. Manual adjustment dial for air loft of pad. The #1 selling therapeutic overlay in the US, Geo-Matt is used by thousands of hospitals and nursing homes nationwide. It has been proven effective in clinical trials and studies as an aid in the prevention and treatment of pressure ulcers. Ulcers have worsened or remained the same over the past month. Has large or multiple stage 3 or stage 4 pressure ulcer(s) on the trunk or pelvis. Has been on a Group 2 or 3 surface immediately prior to discharge from hospital or nursing facility within the past 60 days. Adjustable modes for pressure relief and rotation therapy at 15, 25, 30 and 45 degrees. Variable rotation times of 20, 30 and 60 minutes. Static mode, left turn, right turn, combination turns. Portable, lightweight mattress replacement system fits most standard medical beds. Waterproof, anti-microbial nylon therapy coverreduces friction and shear. 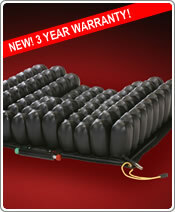 Durable vinyl bottom protects the mattress cell from any abrasive surface. Offers an 8 minute cycle time, adjustable comfort settings for the individual's patient needs. For basic wound care. The Roho Select®low air loss mattress systems are a complete line that offers the most cost-effective alternative for skin protection and pressure sore prevention. Powerful Results - Without Power! Sound impossible! With a standard static air system, it is. It uses patented Constant Force Technology™ to automatically adjust the mattress's network of interconnected air cylinders and elasticized reservoirs to the appropriate, therapeutic levels for each patient, regardless of their weight or position on the surface. Delivers customized pressure reduction comparable to low air loss, while providing patient with a stable surface to maximize functional ability and maintain safe positions. Each cushion features a unique low profile design to provide safety and convenience for getting in and out of chairs, and the air venting holes allow heat and moisture to easily dissipate for a higher level of comfort. The top of the line multi layered variable density foam and gel cushion provides comfort with advanced therapeutic support. The Titanium encourages correct patient posture, proper spine alignment, stability and uniform weight distribution. The new CONTOUR SELECT™ Cushion provides the skin protection you expect from a ROHO Group product, with the positioning and stability needed for increased function. The contoured design combined with the simple operation of the ISOFLO® Memory Control™ Unit provides a new level of postural control and stability that has never been achieved in an air cushion. The contoured design positions the pelvis back in the wheelchair, and centers the user comfortably in the middle of cushion. The NEW QUADTRO SELECT Cushion sets the standard in the industry for overall performance in wheelchair seating. Each and every user will benefit from a customized fit through the simple push of a knob. The revolutionary ISOFLO® Memory Control™ offers shape fitting capabilities while the user is seated, allowing quick and easy on-demand adjustment to maximize function. The Equalizer's multi-component construction features an ultra-comfortable viscoelastic "memory foam" top, a contoured foundation layer for proper positioning of the legs, and an extra soft relief zone for high-risk bony prominences. Three zones of a proprietary, gel-like soft polymer provide added pressure dispersion under the thighs, greater trochanters, and ischial/tailbone region. Unlike other products that merely equalize pressures across the seating surface, the patented, open pocket design of the Isch-Dish actually eliminates pressure at the ulcer site while ventilating heat and moisture.